A you can see, this is average hardware for a modern laptop – not shabby, but not great either. First, let’s talk about the pros of this machine. As mentioned earlier, the things I like best about this laptop are it’s relatively compact size and weight. This is probably one of the easiest laptops to carry around that has a screen large enough to easily be read. What’s more, it’s powerful enough to be genuinely useful. Another thing I like is the speedy (albeit small) M.2 solid state boot drive and the 8GB of DDR4 RAM. Together, they allow for fast booting and decent system performance. Now I’ll discuss the cons (and there are several). Although extremely fast, at a mere 128GB this machine’s SSD is simply too small to be useful for everyday computing purposes. While adding an external USB hard drive would certainly help, that would also be a serious inconvenience for a travel laptop. Another huge disadvantage is the paltry number of USB ports. There are only two of them, and one of those is a slow USB 2.0 port. Not good. The lack of an optical drive is no big deal since you can always add an external USB DVD drive if you need one, but it would still have been nice to have one built into this laptop given its relatively hefty price and moderate weight. Bottom line: This is a decent entry-level Windows laptop, but in my opinion there are better machines for the money. 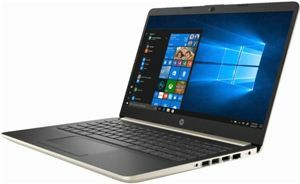 Click here to read more about the HP 2019 14-CF0014DX 14″ Laptop at Amazon.